One of the only LYS in our valley is going out of business, so I went over to say my good-byes. I was not able to shop there very often. I do too many other crafts. The owner Karen is a very nice. I am sorry for her sake that her second home will be gone. She said it was just getting too stressful. All the yarn was 50% off. I wasn’t really interested in buying anything. 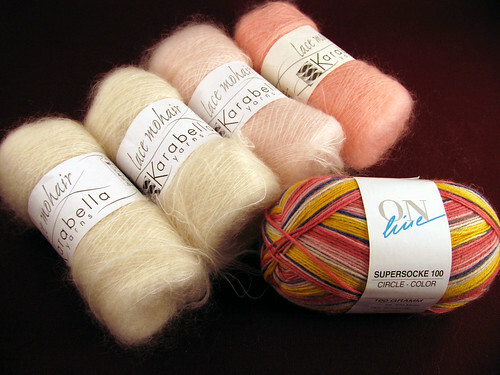 Then a couple of projects I want to make came into mind and I found some yarn. With spring around the corner I was very drawn to some of the peach yarns instead of the usual brights that catch my eye. I settled on one skein of sock yarn. I want to try a two circular needle pair. A friend, Marsha, makes really pretty textured ones in self striping yarn. Hopefully mine will turn out half as nice. Then I have in the back of my mind an Estonian lace shawl form Nancy Bush’s new book. There wasn’t very much lace weight yarn left, but I thought these skeins would make a pretty shawl. I’ll use the darkest skein for the border. So two more projects are added to my list. I am still working on the sale yarn I bought last August. One project is 80% done and the other 60%. Too many projects, too little time. I am also trying to learn photoshop. It is a fabulous program. I am amazed at all it does. Maybe I can write about that another day. This entry was posted on Wednesday, April 1st, 2009 at 3:00 am and is filed under Yarn. Tagged: Yarn. You can feed this entry. You can leave a response, or trackback from your own site. I just purchased PhotoShop Elements 7 and would love to hear of your experiences trying to learn PS!